Permitted initially for daytime operations by the DGCA, the new airport will slash the travel time between Mumbai and Shirdi from six hours to barely 45 minutes. Devendra Fadnavis was also a part of the inauguration of Shirdi airport along with President Kovind. 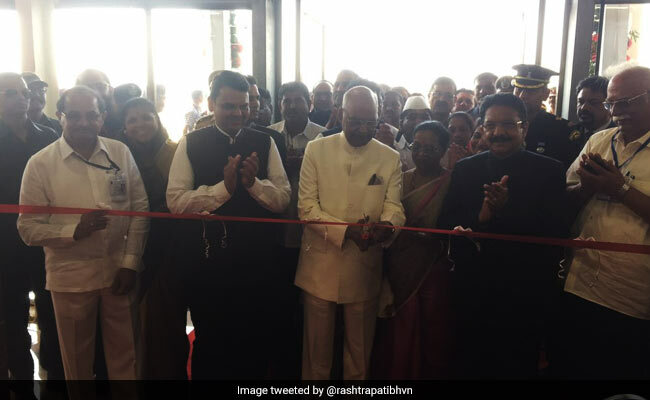 Ahmednagar: President Ram Nath Kovind on Sunday inaugurated the swank new Shirdi Airport in Ahmednagar and the inaugural Alliance Air commercial flight to Mumbai. The inauguration of the airport, developed by Maharashtra Airport Development Corporation or MADC, also marks the start of the year-long centenary celebrations of Shri Saibaba Samadhi for which over 11 million pilgrims are expected from around the world. The small town in western Maharashtra is a world-famous pilgrim spot for the 'samadhi' temple of a 20th century saint, known as Saibaba, who is revered by all communities. Permitted initially for daytime operations by the DGCA, the new airport will slash the travel time between Mumbai and Shirdi, around 240 km apart, from six hours to barely 45 minutes. Present at the inauguration were Maharashtra Governor CV Rao, Chief Minister Devendra Fadnavis, Leader of Opposition Radhakrishna Vikhe-Patil, MADC Vice-Chairman and MD Suresh Kakani, other top central and state officials.